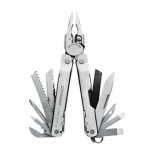 This basic Leatherman is the best of its kind. Best value for money. This tool follows the steps of the original PST with additional lockable tools, scissors and rubberized finger grooves for better ergonimics. This tool proves that even cheap and basic multitools are excellent. It has sturdy build quality, the tools are very functional (except I had to modify the small flat screwdriver to work with smaller screws), the locking mechanism works flawlessly and the whole tool is light and pocketable. This tool is no longer produced but you might still get this from eBay for a bargain. If you want a basic tool that is still manufactured, go for Blast or Rebar.